Mike Myers Teases Austin Powers 4: "It's Looking Good"
Does Mike Myers Want an "Austin Powers 4" Movie? Mike Myers is saying "yeah, baby, yeah!" to a fourth Austin Powers movie. The 55-year-old actor, who starred in all three Austin Powers films from 1997 to 2002's Austin Powers in Goldmember, has opened up about a possible new film in the franchise. While it's been 16 years since the last Austin Powers movie was released, fans are still holding out hope that there will be a fourth film. So what are the chances the fans will get another Austin Powers movie? "It's looking good, it's just tough, you know, it takes a long time to write the script, you want it to be fantastic," Myers told E! News at the premiere of Bohemian Rhapsody in New York City this week. "I have three kids under the age of seven now, you know, [director] Jay [Roach] is just back to back making movies," Myers continued. "But we've met and, I don't know, it's looking good, we'll see." He also added, "I'd love to do it, it's so much fun doing it." It was just months ago that Myers mourned the death of his co-star Verne Troyer. "Verne was the consummate professional and a beacon of positivity for those of us who had the honor of working with him," Myers said in a statement in April. "It is a sad day, but I hope he's in a better place. He will be greatly missed." Just weeks earlier, Myers had revived his role of Dr. Evil on The Tonight Show, giving his fans even more hope that another film is on its way. 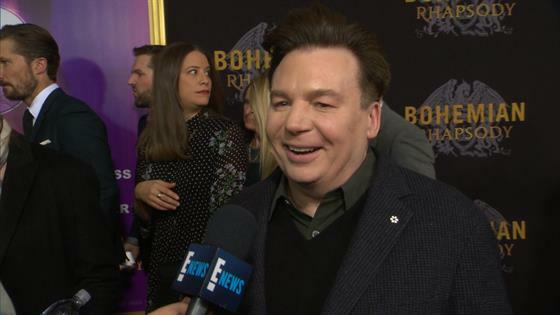 See what Myers had to say about Austin Powers and Bohemian Rhapsody in the E! News interview above! Bohemian Rhapsody hits theaters on Nov. 2.